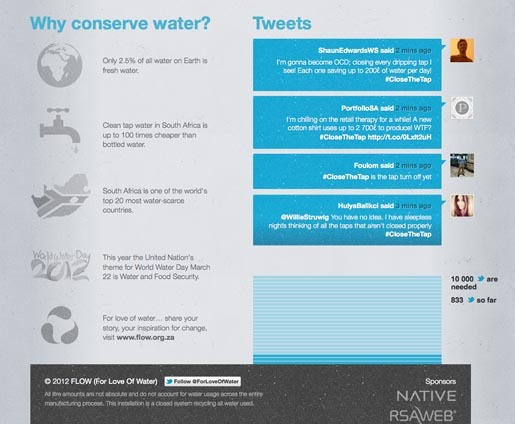 South African water conservation NGO FLOW (For the Love of Water) is urging 10,000 Twitter users to #CloseTheTap using only tweets as part of World Water Day (March 22). The website developed for the campaign, closethetap.co.za, live streams a running tap from Cape Town, South Africa, a symbol for daily water wastage. The tap, connected to Twitter, will close with water saving tweets carrying the #CloseTheTap hashtag. 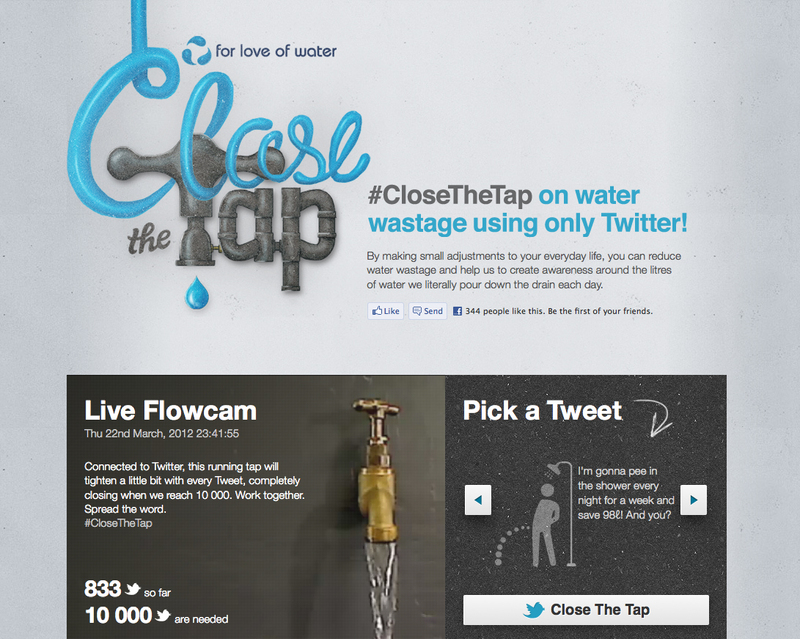 The Close The Tap campaign was developed at Native, Johannesburg and Cape Town, by creative director Adam Whitehouse, strategy and concept team Mari Basson, Ashton Hayes, Keenan Mulvaney, developers Jethro Flanagan, Jamie Golden, designers Nelleke van der Maas, Nic Rix, copywriter Keenan Mulvaney, UX Peter Hidden, media planner Ronen Cohen, community and PR team Aneshree Naidoo, Arne Dunckers, Savannah Walley, and project manager Isobel Ringrose.